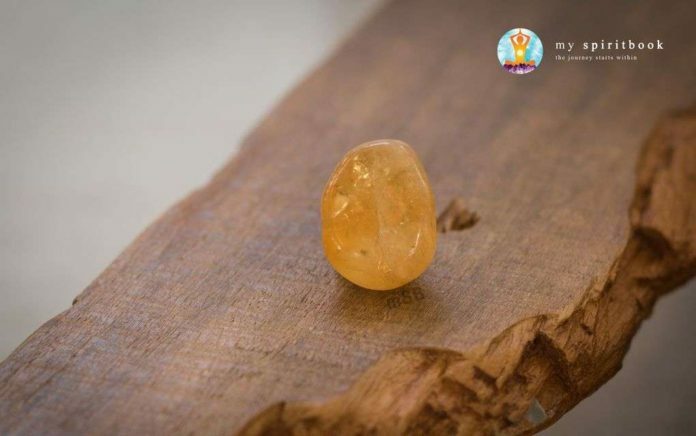 The yellow-colored citrine crystal is an abundance stone and it brings you success, optimism and confidence. In crystal healing we use it to purify and stimulate the solar plexus chakra. The citrine crystal is one of the basic crystals of our Crystal Healing Level 1 Course. The name citrine is derived from the French word “citron” which means lemon. Since it is the stone of happiness, it also helps with depression. We use it to ease digestive problems. Citrine is also known as the “money stone” and the “merchant’s stone” since it brings abundance and wealth. You can only control your reactions to them. Digestion – It supports and purifies the digestive system, the stomach, the liver, the gallbladder and the spleen. Diabetes – It is helpful for diabetes, because it stimulates the production of insulin. Powerful Purifier – Citrine crystal purifies the system therefore it is beneficial for tissue regeneration. Energizer – It supports the immune system, the lymphatic system and the vegetative nervous system. Bedwetting – It is recommended particularly for young adults, who deals with bed wetting, because this crystal strengthens the kidneys and the bladder. Warming – It carries the power of the sun, its protective power warms not just your body but your soul as well. Accepting/Confidence – This crystal helps to accept yourself and others as you are. It raises your self-esteem and helps to be more confident. Self-expression/Creativity – Citrine crystal encourages you to express your true self. It is very creative and opens you to new experiences. Depression – It aids if you have a depressed self-esteem or suicidal thoughts. It is good for getting rid of emotional toxins. It helps you to let go self-pity, guilt and fear. Optimism – Citrine helps to look forward to the future optimistically. Oversensitivity – By working with a citrine you become less sensitive to overall criticism. It helps to steady your emotions and keep them under control. You become more balanced emotionally. Energizer – It is an energy regenerator and recharger stone. Relationships – Citrine is a good stone for relationships and smoothing family or group problems. Keep a piece of citrine in your wallet/pocket. It will bring you abundance and boost your creativity. I invite joy and happiness into my life. I’m a magnet for success and good fortune.